seawapa.co: Breaking: Photos PROVE Crashed Malaysian Jet was MH-370! Breaking: Photos PROVE Crashed Malaysian Jet was MH-370! Look carefully at the position of the flag on the piece of wreckage in the Ukraine (top of article). Do you see how the trailing edge of the flag (the side with the red and white stripes) is directly over a window hole that is covered with a metal plate. There is no window there. Now carefully look at the second photos of both MH-17 and MH-370 shown below. 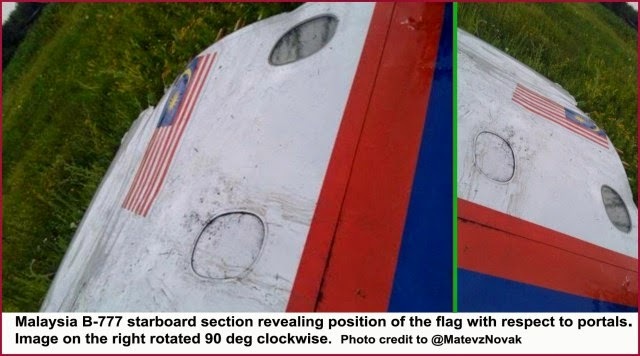 In the photos of MH-17 you see clearly see that the trailing edge of the flag is lined up with a window! But in the photos of MH-370 you see that the trailing edge of the flag is directly over a the metal plate covering up the window! Photographs don’t lie! So this plane is MH-370! There is other evidence for the jet crashed in Ukraine was MH-370. Stew Webb (www.stewwebb.com) is a federal whistleblower who has hundreds of high level contacts within US Intelligence. One of his contacts told him about 3 months ago that MH-370 landed in Diego Garcia but was later flown to Ukraine to be used in a false flag attack to get a war started! Stew went over this information on VT Radio on his Monday July 21st show on Revolution Radio (www.freedomslips.com) Stew’s information along with the solid photographic evidence makes this a VERY important piece of information and it would make sense that there were reports of frozen bodies and bodies that were already decomposed found because they would need to stuff this plane with bodies to make it seem convincing. Obviously the Malaysian government would have to be involved with this evil at the highest levels. You know we’ll never be told the REAL results of DNA testing and if they matched the DNA to the supposed passengers of MH-17. This would also tie in with reports coming out of VeteransToday that pictures circulated by mainstream news of MH-17 right before take off from a “passenger” have been proven to be false – it had the wrong numbers painted on the aircraft so could not have been MH-17! You can read about this information here. Malaysia Airliner Missile Strike: Was it MH-17 or MH-370? Of interest is a photo of the starboard section of a crashed Boeing-777-200 with alleged tail number 9M-MRDassigned to fly route MH-17. Although another photograph shows “MRD” as prominent crash debris, this could be a likely “re-painted” attempt to show the world there should be no confusion between the missing airliner (MH-370) and the presumably “doomed” flight, MH-17. Photo taken at the crash site is evidence that aircraft designated as Flight MH-17 was not involved in the missile shoot-down. The window configuration in the crash site does not match the Boeing-777-200 aircraft reported to be flying as MH-17 (9M-MRD). Instead the starboard fuselage section in the photograph more closely matches Flight MH-370 – the aircraft that is now known to be hijacked without a trace – until, perhaps now. Here’s the two critical photos again. The first photo shows the trailing edge of the flag (the side with red and white stripes) lining up with a metal plate over a window on a piece of wreckage from the shot down plane in Ukraine. Now look at the pictures below. The position of the flag is wrong for MH-17 but a perfect match for MH-370! On MH-370 the trailing edge of the flag is directly over the metal plate over the window! Get the word out – this is CRITICAL information that must be shared to stop WW3! This is the interview that made Facebook so mad, they locked me out of my own account to censor it! Who and how 9/11 was done with Gordon Duff. Many shocking secrets told here! Gordon Duff Blasts the Truth! Note by Glenn: Please friend me on Facebook if you are a Truth Warrior! I’m urging all truth warriors to go to Facebook and LIKE the “VT Truth Warriors” page – huge stories breaking there and we are taking ACTION! Also get my free ebook “How to Spread 1,000 Times More Truth” using simple tips. Visit my Youtube channel also for VeteransToday Radio an more! We are being lied to by our fake news and the lies are increasing every day. We have no more time to waste. If everybody spreads as much truth as possible we can turn this around! Let’s do it together!